Every year, beginning around the first week of February, the interwebz gets its cynical on in a big way, and you can almost hear the sound of its eyeballs rolling back in its jaded head. Valentine's Day is far too commercial, or we don't need to be told when and how to love someone, or the calendar doesn't dictate love. And I just sigh. Sigh. 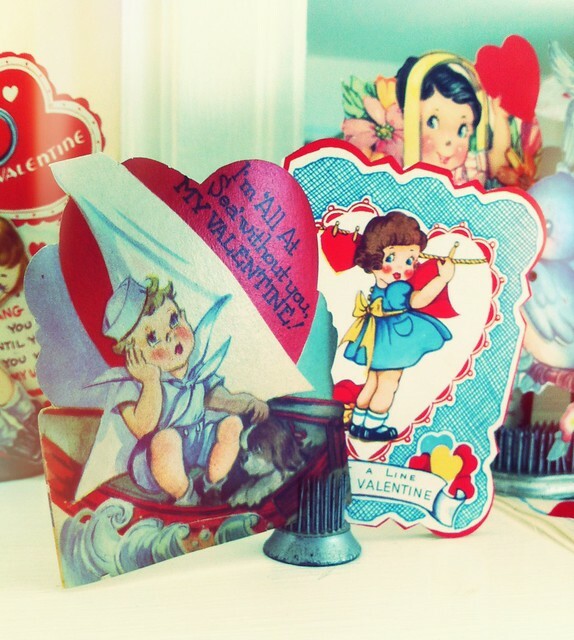 Of course Valentine's Day doesn't dictate these things! If the interwebz thinks it does, then I think the interwebz doth protest too much. 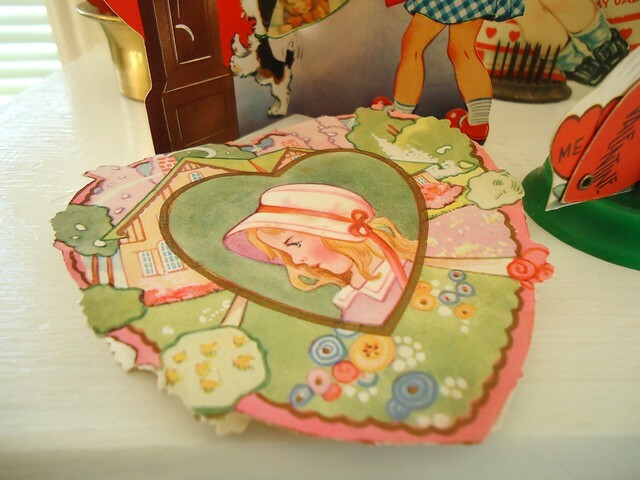 Valentine's Day celebrates that we do love. Not how to love. We'll celebrate pretty much anything (today is also Ferris Wheel Day), so I'm thinking it's really okay that we have one day that is designated to LOVE. Seems pretty major. 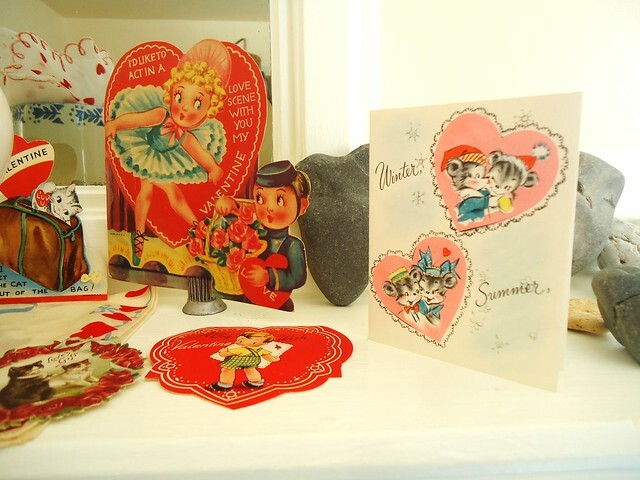 Valentine's Day is merely a marking of time, a festive little blip (with some interesting historical back story) in this last stretch of winter, when most of us (well, those that live in the Northern Hemisphere) are starting to feel those cabin walls close in. It's mid-February in case the interwebz hasn't noticed and our brains, bodies and yes, our hearts are feeling a little down in the funk. Yes, we've noticed the daylight returning by minutes each day, but with 30-inches of snow on the ground, it's not like most of us are out there lounging on the beach or digging furrows in the soil. Not yet. Soon, but not yet. So here's an idea- let's jazz things up a bit and decorate with bright red hearts and fresh flowers and eat our endorphins and antioxidants out of satin boxes. Try a little tenderness, yes, more tenderness than our usual tenderness, let's love on someone, some pet, some community, some friend. Love on yourself (even if that just means breathing a little more deeply, today)! Make an effort. Of course you love with a full heart every day (or I hope you do.) No one is claiming you don't, interwebz. Get over yourself and do a little extra. 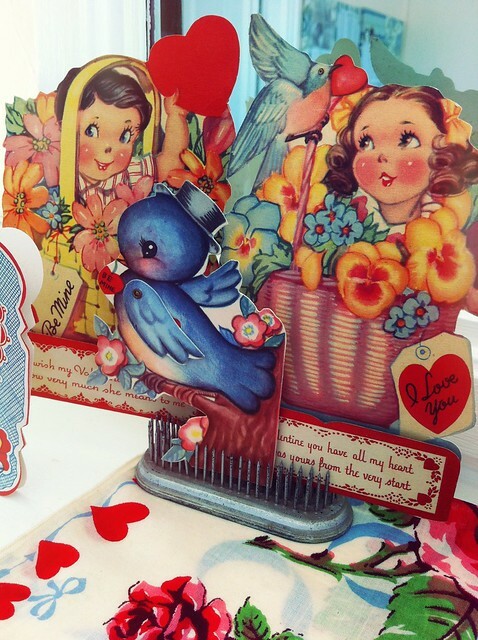 Make a card, lay a pretty table cloth, bake a cake, sing all the love songs you know all day long, plaster paper hearts all over your community...but please, interwebz, please, stop with the self-congratulatory I'm so above Valentine's Day assertions. It makes you sound mean, stingy, and cranky. Interwebz, look. It's like this. It's fun to have those nights out with friends, (or some equivalent activity) right? It feels refreshing, invigorating, it restores balance. Well, Valentine's Day is just like that. Interewebz loves its friends every day, so why then, make a big deal out of it and set aside a special night out, at all? Because, it's something to look forward to, it can help reconnect, keep things interesting. So stop mocking people who enjoy showing a little extra on this day. If you must roll your eyeballs, do it quietly. 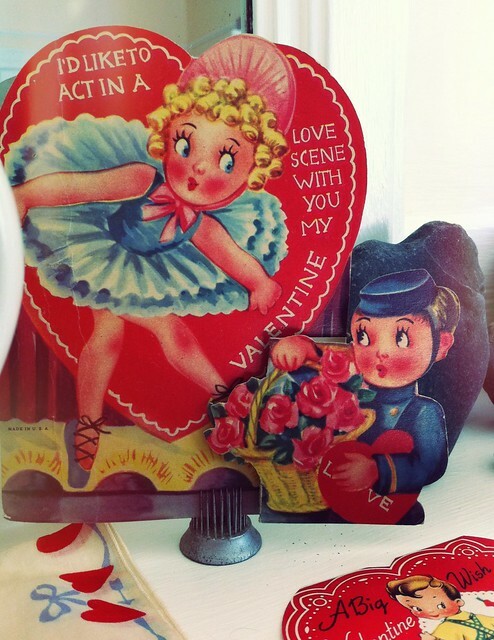 But I think you should stare at these incredibly adorable vintage Valentine's instead. That bluebird above? Has hinged wings. Like I said, adorable. 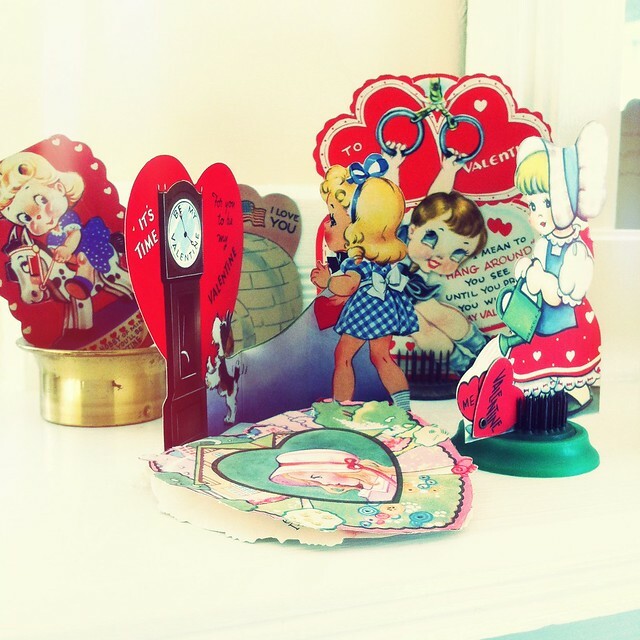 Did you use a hairbrush to stand the cards up? Clever! Thanks, Cassandra! I didn't use a hairbrush, in fact. I used my collection of vintage flower frogs. They are spikey things that sat in the bottom if flower vases that held the stems in place. They are great for displays like this one. That makes more sense, still quite clever!